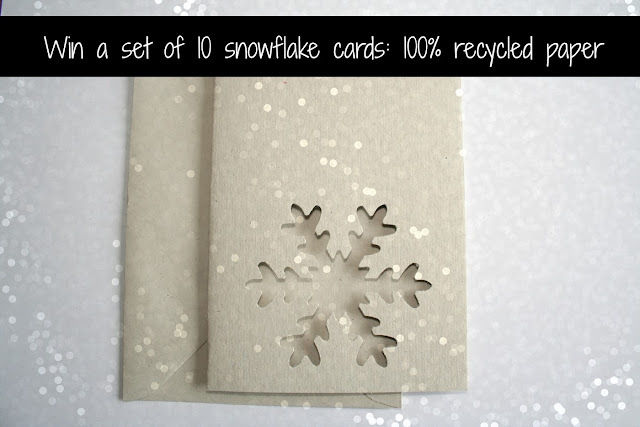 To win a set of 10 snowflake cards, you need to tell me what item is your favourite (in my shop currently) and why. Please simply leave a little comment below with the link to the item. One will be picked at random (by a number generator) to be the winner. Only one entry per person. Competition opened until Friday 8 November 11am (Berlin time). The winner will be announced later on the same day here and via Facebook and Twitter. The winner will have until Monday 5pm (Berlin time) to claim their prize. This one! http://www.etsy.com/fr/listing/113027032/invitations-fete-papier-kraft?ref=shop_home_feat Very simple with a punch of color! I didn't know you were so artistic Annabelle! I love your minibusiness cards: http://www.etsy.com/listing/96670061/recycled-business-cards-informal-calling?ref=shop_home_active! It's too hard to choose just one... all of the items are so lovely. We had the best wedding invitations from PaperPapelPapier last September! So much that I love! Like the mini business cards (having just moved these would be really useful to hand out to people!) But also really like these celebrate cards http://www.etsy.com/listing/113027032/party-invitations-string-lights-birthday?ref=shop_home_feat with lots of parties in the next couple of months these would also be useful! and the winner is ... Lia. Congratulations. Please email me at paperpapelpapier at gmail dot com.